Please find below a selection of holiday cottages in Whitby. Here you will find self catering cottages across Whitby, and in nearby Ruswarp, Sleights, Robin Hood's Bay and Goathland. Step back in time to the days of Captain Cook in the historic port of Whitby, surrounded by spectacular cliffs and bays on Yorkshire's breathtaking Heritage Coast. It's very charming, very atmospheric and a very fashionable place to stay. Dominating the town, the remains of Whitby Abbey stand proudly on a headland and there's an interesting visitor centre explaining why this is such an important archaeological site. Close by are the 199 steps that lead you down to the old town, a warren of narrow, cobbled streets lined with lovely little shops including maritime memorabilia and Whitby Jet jewellery. The harbour is a delightful place to explore, bustling with local fishermen, colourful boats and pleasure craft. Feeling peckish? From sea-shanty inns and traditional tea rooms to stylish seafood restaurants, Whitby serves up some delicious food. There's so much to see and do on a Whitby cottage holiday. Relax on the award-winning beach or play golf on fairways overlooking the sea. Join a fishing trip or a sightseeing cruise along the coast. Visit all kinds of attractions like the Captain Cook Memorial Museum (from where the great explorer served his apprenticeship), the Whitby Museum and Art Gallery and the Dracula Experience - it was Whitby's very own parish churchyard that inspired Bram Stoker to write his legendary novel, Dracula. Annual events not-to-be-missed are highlighted by the Whitby Folk Festival and Regatta, along with the Captain Cook Festival. And with the wild North York Moors National Park on your doorstep, it's no wonder our Whitby cottages prove so popular. Choose a great Whitby holiday rental! Converted fishermen's cottages in quiet backwaters, spacious apartments overlooking the sea, Victorian residences oozing character - when it comes to holiday rentals in Whitby, there are so many kinds to choose from. 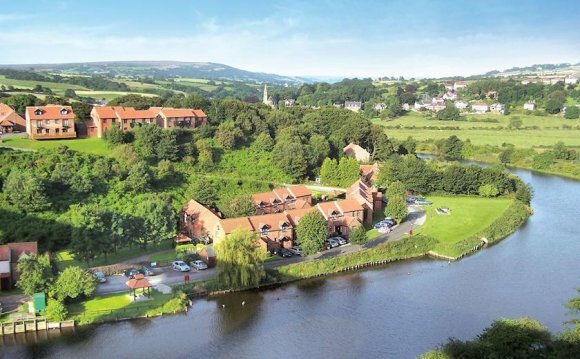 We also have a choice of Whitby holiday lets a short drive from the main resort, nestling in quiet pockets of picturesque countryside - great for those of you who prefer to stay off the main tourist track, but still have amenities close to hand. And don't forget about Whitby's extremely attractive neighbours such as Robin Hood's Bay, where you'll find even more Whitby holiday rentals. If you're planning a summertime stay, make sure you book ahead and get the exact accommodation in Whitby you want. Otherwise consider a break off-season - there's always something to do in this wonderful Yorkshire town, whether it's sailing, gospel music or Halloween fun with Dracula. And if you're lucky, you might just grab a last-minute deal on one of our holiday lets in Whitby. Check out our complete list of featured Whitby accommodation below and watch out for those special offers. A pretty coastal town pleasantly free of the mass development associated with so many traditional English seaside resorts, historic Whitby justifiably remains one of the most sought after destinations for a Yorkshire coast self-catering holiday . A multitude of attractions for families, both in charming Whitby itself and along the neighbouring coastline at large resorts such as Filey, Scarborough and Bridlington, means that a Whitby holiday cottage offers a great range of seaside activities. Located between Staithes and Robin Hood's Bay, Whitby is also an excellent base for discovering the smaller towns and ancient fishing villages, steeped in folklore and smuggling history, that nestle among the rocky cliffs of this beautiful section of the North Yorkshire Heritage coastline. Renting a Whitby cottage also gives visitors easy access to the dynamic city of York, with its fabulous shopping, superb museums and historic cathedral and Minster, as well being on the doorstep of the more remote beauty of the spectacular North Yorkshire Moors National Park, a designated Area of Outstanding Natural Beauty. The sea has always defined Whitby, and today the busy port, vibrant harbour and historic Whitby Lifeboat Museum still form the hub of town. Captain Cook is Whitby's most famous son and visitors can take a themed boat cruise around the coastline on a replica of his ship the Endeavour and visit the town's Captain Cook Museum. The beaches at Whitby are stunning and on a 'good weather' day there's nothing better than to simply relax and soak up the sun on one of the excellent stretches of golden sand, making sure to leave time for a spot of rock pooling once the tide goes out. Tuck into award-winning fish and chips on the seafront and then explore the labyrinth of ancient, winding streets behind the harbour. Check out the Whitby's Dracula connection - the town was the inspiration for writer Bram Stoker's world-famous vampire tale - and is awash with themed trails and tours, and there's even a Dracula museum. Hike up the famous 199 steps to St. Mary's Abbey for fine cliff top views of the Yorkshire coastline and a wander round the ancient abbey that inspired one of the most famous gothic novels of all. Away from the coast, your Whitby cottage is a passport to a host of picturesque rural towns and villages. The attractions of the Vale of York - ancient market towns such as Helmsley and Pickering ; Beverley, with its gothic Minster and famous Races - or historic Driffield, capital of the Yorkshire Wolds, are within a day's visit. York, home, amongst others, to the National Railway Museum and the acclaimed Jorvik Viking museum, is also within easy reach.